Tip blight is a fungal disease that affects Scots, mugo, ponderosa and Austrian pines. The Sphaeropsis sapinea fungus responsible for the disease normally targets mature, cone-bearing trees. Pines, however, are susceptible at any age, advises Kansas State University plant pathology specialist Ned Tisserat. Uncontrolled tip blight infestations will return every year, weakening and eventually killing trees. Systemic fungicides applications help control tip blight. Other fungal diseases attacking pine trees include the Siroccocus blight, deadly to shoot tips and year-old twigs. Pine-oak and Western gall rusts produce branch-killing galls. Western gall rust is especially infectious to Eastern white pines, says University of Kentucky extension professor John R. Hartman, Ph.D. Blister rust and Atropellis and Sclerododis canker fungi all kill the twigs, branches or trunks of affected trees. Formulated for application on trees already infested with a fungus, systemic fungicides enter the tree at the site of application. Local penetrant systemic fungicides remain in the tree's tissue at the application site, preventing the disease from development there and in nearby tissue. Other systemic fungicides translocate, spreading into tissues away from the application site. With correct timing, some systemic fungicides can prevent the spread of recent infestations. 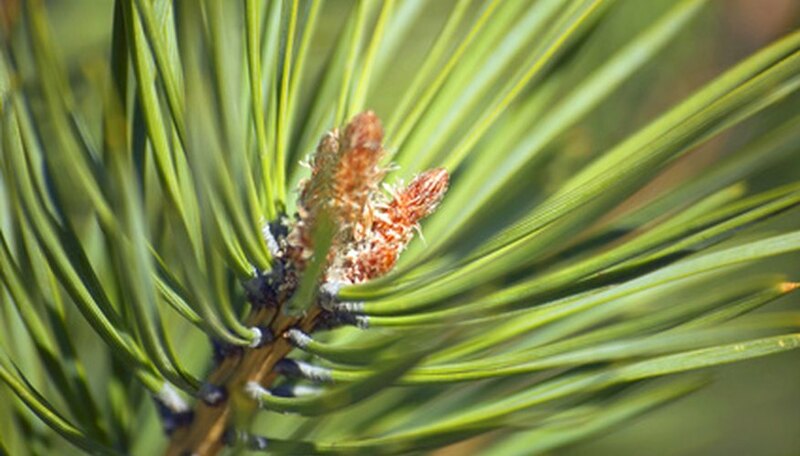 Depending on the infection and the fungicide, spread prevention may be possible between a few hours or a few days after a pine tree is initially infected. These fungicides reduce the number of applications needed to fight fungi. Used only when infection is present, they eliminate the process of spraying at established intervals. While they prevent infections from spreading, they won't restore already damaged tissue. A systemic fungicides has both advantages and disadvantages, says the University to Illinois Extension's Bruce Paulrud. Working from inside a pine tree, it doesn't wash away. It may destroy fungus already inside the tree. A translocating fungicide can reach the tree's roots and new tissues, while protective fungicides can't. Systemics, however, tend to be more expensive than protective fungicides. Another disadvantage is that many systemic fungicides target a narrow range of pine tree fungi. A wide range of fungi infect a wide range of pine tree species. Not all systemic fungicides are equally effective against each disease. Professor Tesserat recommends thiophanate-methyl, propiconazole or copper-based systemic fungicides to treat Sphaeropsis tip blight. Your local agricultural extension can suggest options for other fungal pine diseases. Observing new shoot development of pine trees is essential to time your systemic fungicide application properly. Give the trees their first application when the new spring buds begin elongating, advises Tisserat. Spray a second time in 10 to 14 days. Where the red weather is consistently rainy, trees may benefit from a third application in two to three weeks. A high-pressure sprayer will completely saturate the tree's crowns. Coverage of all foliage is essential.